Price: $ $4.95 Here is the link to buy this map from the Gem Trek website. Grid Lines: UTM ZONE 11 NAD 83, 1000 metre grid. Lat/Long marks every 01' in margin. Folded map and trail guide. Scale 1:20,000. Contour interval 25 metres. Map shows hiking trails and alpine route. Relief-shaded map. Printed on paper. Full colour on both sides. Gem Trek’s Lake O’Hara map meets the needs of visitors looking to explore one of the finest backcountry destinations in all of the Canadian Rockies. Reaching Lake O’Hara, in Yoho National Park, requires advance planning—and we help you with that, as well as showing all hiking opportunities in the region. This map features detailed cartography, accurate hiking trails, and all the most significant natural features of the region. On the back are descriptions of the most popular hiking trails—with special emphasis given to the Lake O’Hara Alpine Circuit—as well details of services and transportation. 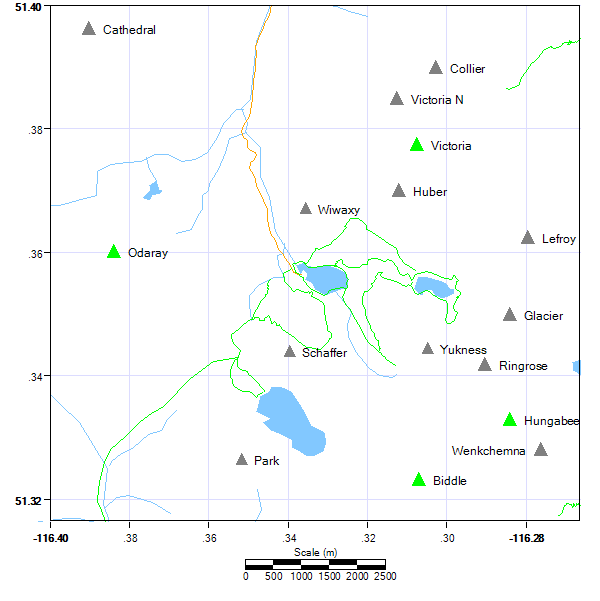 This map covers the entire Lake O’Hara region, from Duchesnay Basin the west to the highest peaks of the Continental Divide in the east and from the access road in the north to Lake McArthur in the south. Popular hiking trails on Lake O’Hara map include Lake O’Hara Lakeshore, Lake Oesa, Lake McArthur, Opabin Plateau, Linda Lake, Cathedral Prospect, and the Lake O’Hara Alpine Circuit.